Right of Way. Janet Lilo. Artspace. 10th May – 11th August. I am having a lot of trouble figuring out this piece of writing for Janet Lilo’s Triennial work. I want to try and talk about the kindness and respect shown to us volunteers by Janet and the Artspace crew when helping install the work the other day. Janet showed a genuine interest in us volunteers, giving flowers and notes tailored to what she had learned about us in the short period she had known us. This exchange of time for appreciation that took place is something I keep thinking about lately. The problem I feel is that addressing the appreciation specifically in Janet’s install sort of implies that appreciation usually does not occur in these situations. Like everyone else treats you in a horrible and demeaning way, forcing you to do laborious tasks with no acknowledgement or payment, purely for their own gain. I guess this must happen, I have just been lucky enough to not experience it myself. What I have written could also imply that as volunteers we deserve payment, which defeats the purpose I guess, it shouldn’t be expected, otherwise it could just become about getting paid. Not sure how I am going to tackle it and if you have any suggestions please tell. On a side note. Do you ever feel that you have become part of some system of exchange where time and effort is traded for gifts of appreciation, mainly food, beer or a good word? I really like this system of support I guess I would call it. I enjoy seeing someone succeed, to see it all come together at the end. I want to take Janet and the many others lessons of respect and appreciation on board because if I am ever in that position myself I hope that I can show people these important qualities myself. Anyway get back to me with your thoughts. Funny you mention this, knowing Janet I can only imagine just how much she genuinely would have appreciated all of your help, and actually one of my colleagues mentioned how chuffed you all looked walking out of Artspace with your flowers. She’s only too keen to answer my questions via email. We’ve tried to meet up for a coffee too but can never quite get there. Louisa banters around a phrase quite a bit “WWJD” meaning “What Would Janet Do?”. Very rarely do we come across people who are actually interested in our ideas as art babies, but Janet is always encouraging us and ready to help out where she can. Also any mother of two that has an art production rate like hers deserves an award. I don’t really know that it’s that much of a big problem though. You wouldn’t be concerned about exalting a painting over others because it’s more successful. Likewise, it’s no secret that some artists are more pleasant to volunteer for. I can think of a couple off the top of my head I wouldn’t dear put my hand up for. And yes, I call it reciprocal friendships. Slotted in an L shape amongst international artists such as Yto Barrada, Cinthia Marcelle, Angelica Mesiti and Bruno Serralongue exhibiting at Artspace sits New Zealand artist Janet Lilo. Lilo’s work is located in the front space of gallery and is very hard to miss as you enter its doors. 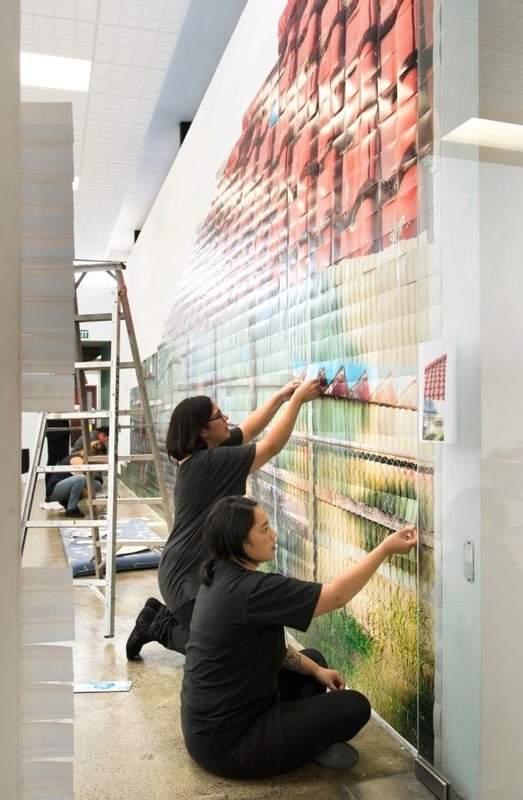 The walls to your left and right are filled with 4,000(if not more) standard 4×9 photo print outs which together form a constructed photograph of different imagery from the artist’s every day. 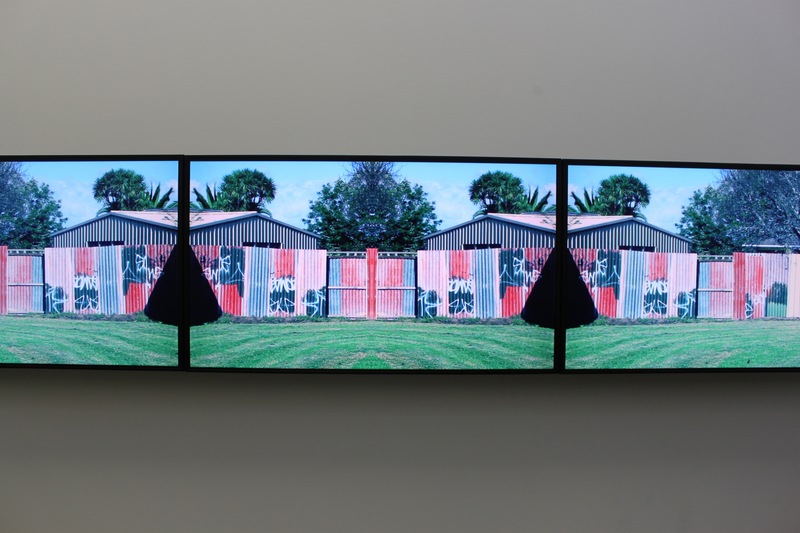 ‘The Right of Way’ also includes three other elements such as HD video, sound and picnic tables installed on the wall offering seating to the viewers. The title ‘The Right of Way’ is derived from the driveway where Lilo lives with her family. Lilo explores Hou Hanru’s theme of the 5th Auckland Triennial ‘If you were to live here..’ by reflecting on her immediate surroundings. The Audience becomes privy to the multicultural community that surrounds Right of Way Drive as Lilo investigates the space around her through film, photography, objects and sound. 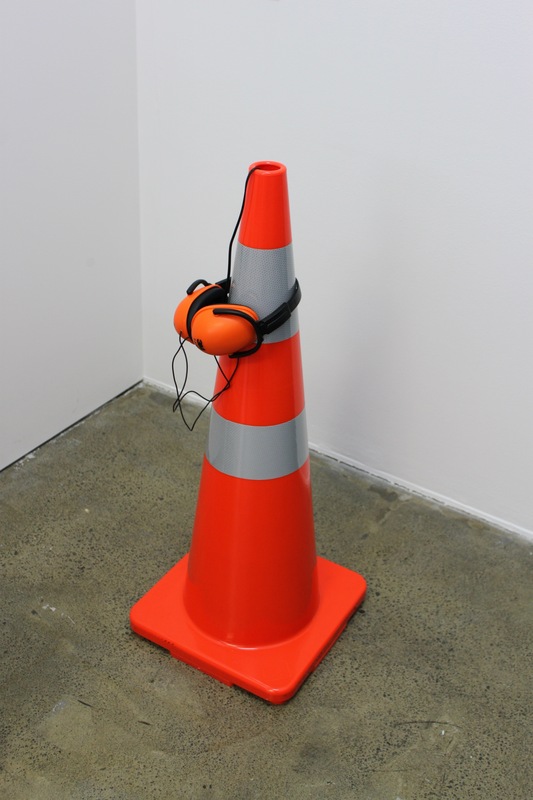 We can pick up headphones worn by labourers that rest on large orange cones placed around the gallery and listen to the sound and different languages around her house i.e. the neighbours chatting whilst listening to Spawnbrezzy and Ria’s track ‘Winning’ (I imagine late on a Friday/Saturday night). It is these small every day gestures the allow Lilo’s work to evoke a strong sense of familiarity from the viewer while entice the viewer to keep searching for connections between themselves and the work. Similar to the artists she is showing next to Lilo has a strong social practice where building relationships between herself and the community is just as important as the work she makes. This is shown by the way that Lilo photographs which documents aspects of the working class without stereotyping it. 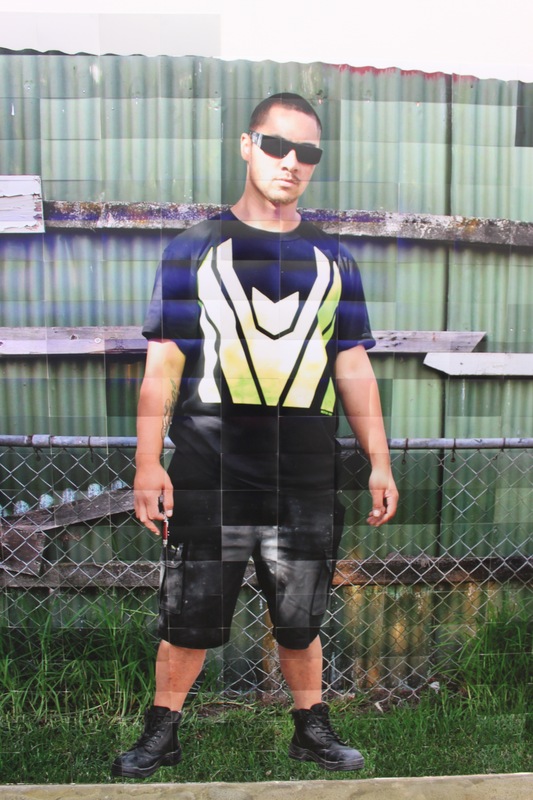 The constructed images used for the large scale photo installation included imagery of CRT screens, a trailer, a corrugated iron fence with graffiti on it and a young Polynesian male. These images which are usually heavily loaded with lower income families have been altered and stylized through Photoshop. Through this alteration Lilo has created a potential space for dialogue concerning representation, class, home, space, race and place that are not set out to victimize or villainize anyone. The space allows Lilo to question her own perception of the place she is from and how that perception has changed over time. Janet Lilo’s ‘The Right of Way’ is a lively work with many different technical aspects that all work well with one another to create an engaging artwork worthy of the 5th Auckland Triennial ‘If you were to live here..’. Previous PostBattle of the Bastards at Basement Theatre.